Having international cosplayers visit our country is always a delight. Who wouldn't be excited to meet someone who is passionate about the craft from another country and learn how they prepare for their own cosplays. One of the cosplayers known in the international scene is Reika. 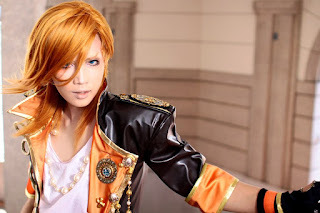 The image above is one of her recent and most loved cosplays, Ren Jinguuji from Uta no Prince-sama: Maji Love 1000%. 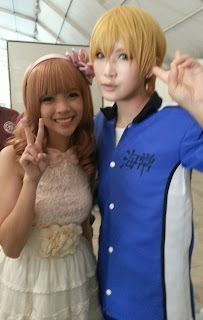 The first time Reika was here in the Philippines was last September 29-30 2012 for Cosplay Mania 2012. I wasn't able to meet her then but after a few months, I was able to meet and interview her. Reika was the special guest for the recently concluded AME 1UP at the World Trade Center last February 23, 2013. Here's an excerpt of my interview with her. I’m looking forward to meeting the people here and of course the food too. A few weeks ago, you asked your followers what costume should you bring to your visit in the Philippines, what costume/s did you bring? Everyone here is passionate about fashion and cosplay. I brought here one of my favorite costumes. I cosplay the characters that I like the most. Are you excited to meet your fans here in the Philippines? I’m excited but a little nervous too. Everytime actually. Do you have any anime/manga that you were fond of in your younger years? Rather than anime, I like games when I was much younger like Final Fantasy. I was able to cosplay a lot of the characters from the games that I played when I was younger. How do you feel whenever you are invited to go out of Japan for cosplay conventions? Of course I get excited about being invited but because I’m a cosplayer from Japan, I kind of represent Japanese cosplayers so I always think that “I have to do my best” or “I have to present myself properly” every time I go abroad. I’ve seen a little of the event this morning when I came in, and it feels like a Japanese festival so I think its really fun. I’m always asleep. Sleep. Watch Anime. Sleep. Watch Anime. I don’t actually leave my bed. Haha! Well, that's the end of the excerpt of my interview with Reika. I'll be posting the full interview and video soon so wait for it okay? :) Reika was so nice, approchable and super cute too~ If you'd like to share your own experience with meeting Reika, feel free to comment on this post. I got to participate in one of her workshops. I learned a lot. Plus she really is a nice person... Even on twitter you can feel it.